Finnish central bank Governor Olli Rehn doubled down on his push for the European Central Bank to review its monetary policy strategy after years of struggling to generate sustainable inflation. The decline in the natural rate of interest has reduced the room for traditional monetary policy to stimulate the economy, the Governing Council member said in Washington on Friday. With inflation expectations stuck too low, central banks will need to keep unconventional measures in their toolbox. Rehn has made a rethink of the ECB’s strategy a central plank of his candidacy in an increasingly heated race to succeed Mario Draghi, whose term as president ends in October. The field of potential candidates includes Rehn’s predecessor, Erkki Liikanen, Bundesbank President Jens Weidmann and Bank of France Governor Francois Villeroy de Galhau. 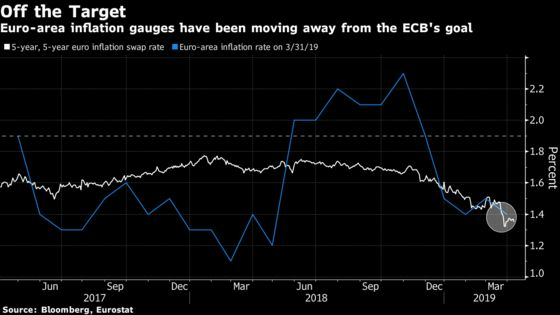 Another contender and current ECB Executive Board member, Benoit Coeure said last month that policy makers aren’t discussing changes to how they are targeting inflation by keeping it just under 2 percent over the medium term. The last time the ECB reconsidered its policy framework was in 2003. Draghi signaled this week he may be open to a new evaluation, cautioning it would take several months. He said officials should wait for the Federal Reserve’s own strategy review, effectively leaving any decision to his successor. The Fed plans to report its findings in the first half of 2020.